Ronald Says - memoirs of a music addict: Eagles Flying High! If you don't know this band don't get fooled by their name. It's only rock 'n roll and I like it or what would music sound like when The Eagles crossed with death metal. I'm not sure if this is it but it's certainly a lot of fun. 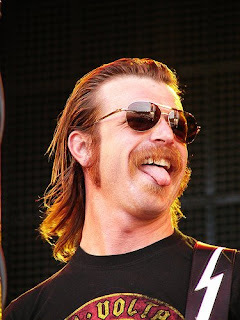 Josh Homme (Queens Of The Stone Age) and Jesse Hughes write the music and Jesse performs it live with a band. Too bad Josh Homme is never there but it's a fact that Jesse and the rest of the band can do it on their own. Jesse is an (over) enthusiastic front man that sure knows how to have a good time. The way he moves on stage can be really funny and he interacts a lot with the crowd now and then taking off his sunglasses and continuously smoking joints (ain't Holland great?). But this doesn't mean the music is of minor importance. Their last album "Heart On" is actually one of my favourite albums of 2008 and live most of the songs even sound better. This band knows perfectly how to please a crowd and to have fun themselves.